Your kingdom has just won a KVK and level 1 gold has emerged. The fastest way to gather level 1 gold is to use the fastest troop types we have available which are T1 Chariots. 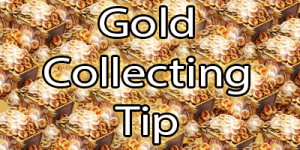 Whilst the troop load is smaller than ranged and infantry, your objective should be to bring in the gold as fast as possible. At 10 gold per tile, your troops spend much more time travelling to and from the tile than on the tile itself. Save your high tier troops for higher level gold tiles to maximise troop load and therefore minimising the troops you have out on a tile. Whilst many of our readers may not see this as much of a tip but it amazes me the amount of people I see gathering with slow marching troops, even T4 troops in some cases. The time it takes some of these players to bring in 1-2 tiles, using the faster troop type you are able to bring in twice, even triple the amount of gold than you would using other troop types. As simple as this tip is, I do hope for those of you not currently utilising the chariots that you are now able to gather with speed and maximise your gold intake. Our kingdom frowns out it (and I’m an R4), but I LOVE the concept of putting any troops on gold. I “know” certain hitters love the idea to hit people on gold “whenever”, so i just stay shielded, and put out troops on gold. The idiots port in, and as they do, i withdraw. I did that for 1 hour, as a test, and I managed to waste 32 of their ports, and no lost troops at all. This is a game of strategy. They don’t usually EVER try to hit me know. How long is each spawn period?? or if.anyone knows the amount of each lvl chests?? i believe that its based on the total amount of gold. For instance (not confirmed) level 1 gold is 250k worth scattered through the kingdom, level 2 is 300k gold etc. it seems once the level 1 gold is down to about 90% drained level 2 will come out. the total amount of gold and how much of each bracket will i assume only MZ has this info. if you don’t know yet that you have to gather them in order to get to lvl6 gold, you should quit right now too. (Plus people plays in many different ways. Your opinion denotes you are close minded and arrogant enough to think that who gather lvl1 gold has to quit). I always have advised my alliance members to use t1 only because if and when you get tile hit the loss is minimal since you typically only send enough troops to clear a tile. Someone who tile hits uses a full march of t4 with a hero, which means you will lose your t4 anyway. I would rather lose t1 any day. You mean calvary – outriders.. This advice, while great for some, would be terrible for others. In some kingdoms, tile hitting may be prevalent, and collecting gold with lower tier troops could mean your troops don’t come back. Totally agree, which is why I only limited this to the level 1 gold. If someone wanted to port in to kill The limited number of T1 ID be more than happy to loose them as they take no time to replace than having T4 out in the open.